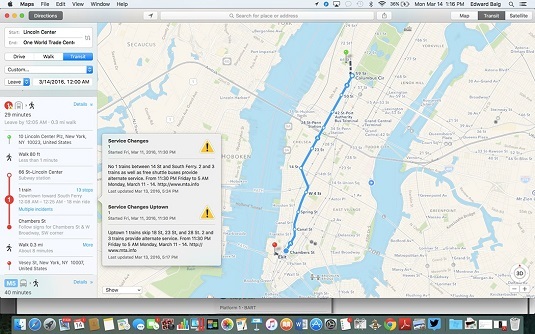 You can get transit directions on your Mac. The Maps app is useful, of course, for helping you determine where you are, what is around you, and how to get to the next place, even accounting for traffic. But you’re not always going to want to (or be able to) drive to that next destination, even if it is too far from your current location to walk. Apple’s solution, at least for select cities, is public transit directions. Maps can display bus, subway, rail, and even ferry routes, along with schedules based on when you want to leave. To get going, make sure the Transit tab is highlighted (as opposed to the Map or Satellite tab), click Transit in the Directions sidebar, and choose your starting and ending points. Next, from the drop-down menu, indicate when you want to leave (soon, 30 minutes, 60 minutes, 2 hours, or a custom time). Click a step in the itinerary you’ve chosen from the options presented (assuming you have more than one choice) to have Maps zoom in on that area. That itinerary will also direct you to the appropriate exit if, say, the subway station where you’re getting off has more than one. Place cards for certain stations will also show you the other transit lines you can pick up at that station as well as their schedules. If your route has service changes or disruptions, you’ll receive indications of them as well. You can receive detailed transit directions in some cities. What’s more, because it is typically impractical to schlep the Mac with you (especially a desktop), you can send the directions to an iPhone or Apple Watch. You can print directions otherwise.